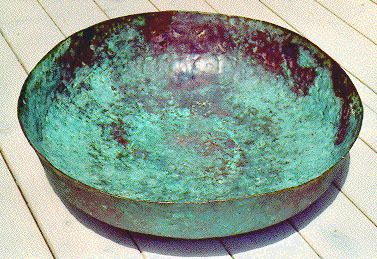 The San Luis Obispo County Historical Society has been donated a large copper basin by Tim Henderson of Nipomo. The basin was found by Tim's uncle some 25 or more years ago in the creekbed of San Luis Obispo Creek near the base of Cuesta Grade. The copper basin is approximately 26 inches in diameter at its mouth and is about 8 inches deep.While we haven't weighed it, Tim estimates its weight at about 80 pounds. This basin is hand-wrought, and the roughness of the hammer marks might indicate that it was still in the process of being formed when it was discarded. 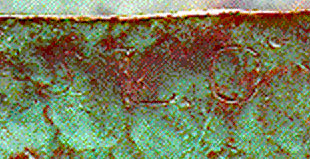 On the outside near the rim the letters "SLO" have been inscribed. The style of the lettering appears to be old with the "S" more open and slanted at about 45 degrees with serifs at both ends.The letter "L" also has a serif on its lower part. This lettering has been interpreted to mean "San Luis Obispo," but whether it stands for the Mission or the town is unclear. Because of the size and the quality of the workmanship, the basin seems to most people who have seen it as a likely Mission Period utensil. With only this to guide us, we first reviewed a list of requirements written by Fr. Junípero Serra at Monterey on July 3, 1775, for an unnamed mission and documented in Volume II of the Writings of Junípero Serra, edited by Antonine Tibesar, O.FM. This list indicates that copper utensils were an important part of the Mission's requirements, but the type of utensils listed were "copper soldered pots" and did not seem to describe our large, heavy basin. However, a little more searching in Documenting Everyday Life in Early Spanish California, The Santa Barbara Presidio, Memorias y Facturas, 1779-1810, edited by Giorgio Perissinotto, uncovered the following entry: "2 copper bottoms of 6 arrobas each: for large, low basins98". The footnote reads: "98A payla (Modern Spanish paila) is a large copper or other metal container: we do not know whether it was used as a large frying pan or for washing." Additionally, an arroba is a unit of weight considered to be the equivalent of about 25 pounds. Each copper basin in the description would weigh about 150 pounds.